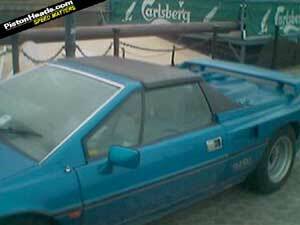 These are the unofficial Esprit Convertible that are still on the roads today. 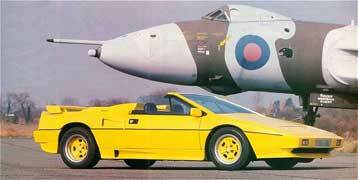 Only seen on the Giugiaro Esprit, two companies chopped the roof and rear hatch and produced a hood and new hatch. 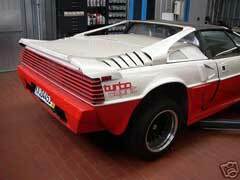 This conversion doesn't look cheap with lots of bodywork changes. 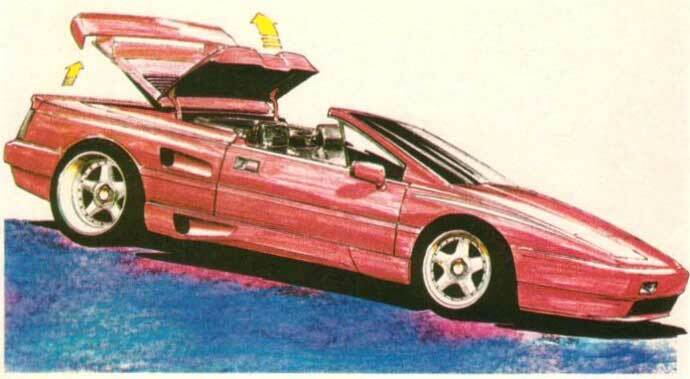 We believe these are sketches from PBB for converting the stevens Esprit to a convertible. Never done, but looks interesting. 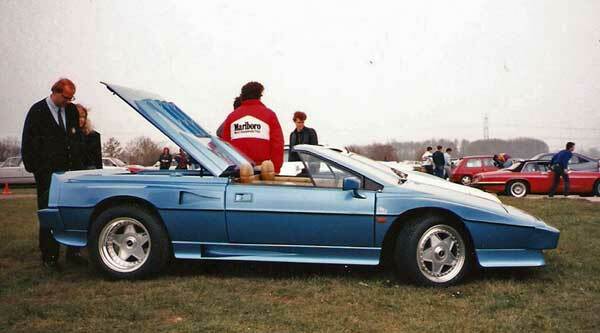 In the early 90s I bought all the moulds, drawings and rights for the st tropez conversion from Paul Bailey (PBB design) near Bristol , and marketed it along with a Rover V8 conversion and other esprit services under the business name of Esprit Developments based in Southend on sea Essex. The kit was further developed from Paul's original design with a one piece rear upper body section that made use of the cars original waist line,turbo tail reproduction dummy turbo sills and an adapted s4 rear wing. 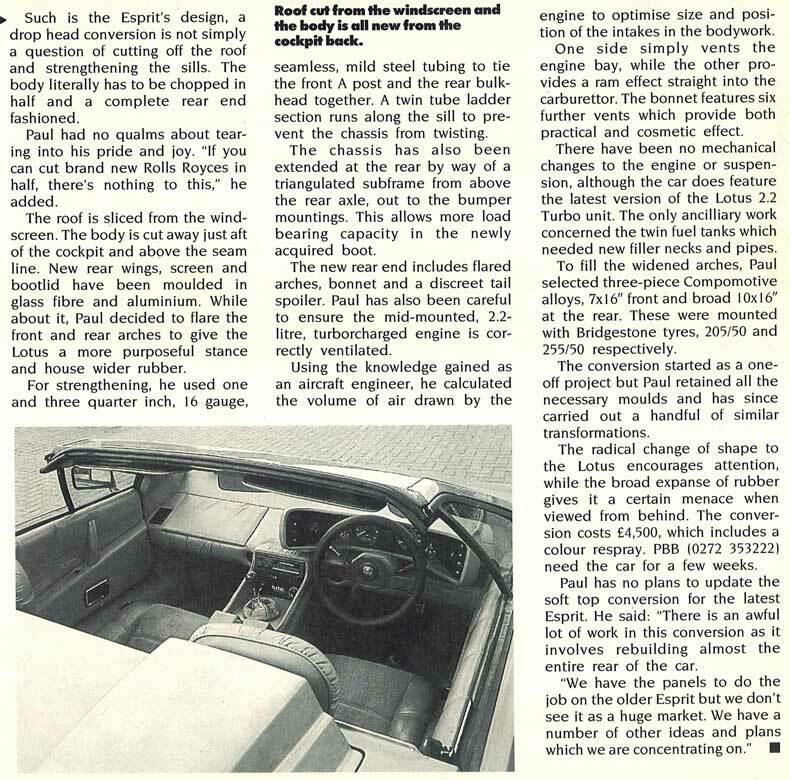 This conversion along with the V8 was ideal for fire damaged esprits of which there were many (and still are today, look at Douglas valley breakers) due to the fact that lotus seemed to use fuel degradable fuel hoses! Both kits resurrected many esprits that would otherwise have been scrapped. 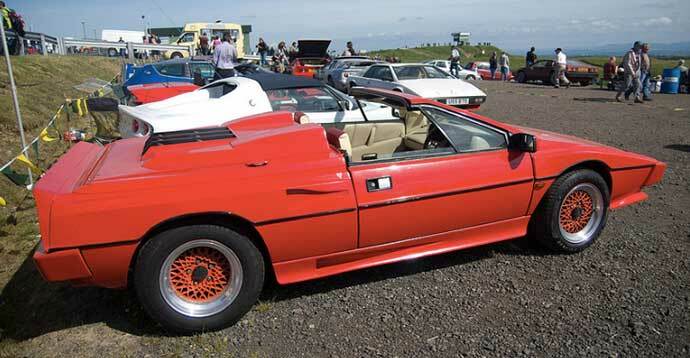 As i said, the convertable kits main component was the one piece rear upper body section which was used to replace the entire original bodywork from the firewall back and from the waist line up.Strengthening was added to the sill from door pillar to the area beneath the fuel tank, then covered by turbo style sills. Windscreen surround was also re-enforced as was the area rear of the chassis to the tail.the result was very strong with virtually no scuttle shake. 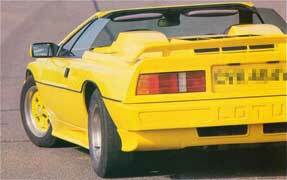 The roof had foldable pillars and was designed so it could be stowed easily in the rear of the engine compartment. It was in great condition for a collectible car, no injuries in it and it was not involved in any car accidents. The V8 conversion completely transformed the car, better torque, better sound, relieable and comparatively economical with no noticeable weight gain, this was because the V8 was stripped of all the ancillaries that it came with, a remote and compact water pump was mounted below the sump along with a smaller sized alternator, lightweight exhaust manifolds were connected to the stock back box. A purpose made gearbox input shaft was used along with a cast aluminium adaptor plate, and no chassis or firewall cutting. could go on, there were a lot of components, too many to list here. To your photos, the yellow car was my personal vehicle for quite a while and was featured in the Club lotus magazine and Top car magazine which these photos come from,they were taken at Southend airport. 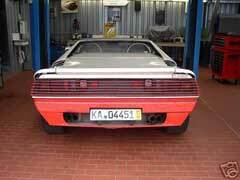 It had the Rover V8 installed, I sold it in about 1996 to a German who took it back to Germany. The red car may also have been one of mine (but with a private Plate} The white car was Paul bailey's first conversion and the blue one his second. Due to the passage of time etc, i no longer have any drawings or photos, but however, I do still have all the moulds and jigs for the st tropez and V8 conversion in storage. This picture was sent in by a German GT3 owner. Found on German Ebay, its some sort of collecters card. Not much more is known about whether the JPS was original or not, personally I doubt it. Wind in the hair motoring is all very well, but when the wind is blowing at 130mph it can be just a trifle unpleasant. It hasn't daunted the purchasers of drop-head Jaguars and Porschess though, and it certainly wouldn't put us off the latest creation of the Hamburg coachbuilding company, Autohaus Kollinger. In fact it wouldn't be going too far to say that their latest creation is the most desirable open supercar of them all. . . 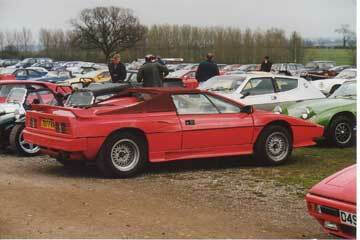 Starting with a Lotus Esprit Turbo, Kollinger have completely redesigned the section to the rear of the cockpit. In place of the fastback roofline and rear window there is now an asymmetric engine cover with individual head fairings and a large air intake on the righ hand side, plus a removeable centre section to give acces to the 210bhp four cylinder engine. In addition to the rear lip spoiler there's also a slight lip along the trailing edge of the windscreen surround in order to deflect the wind over the cockpit. 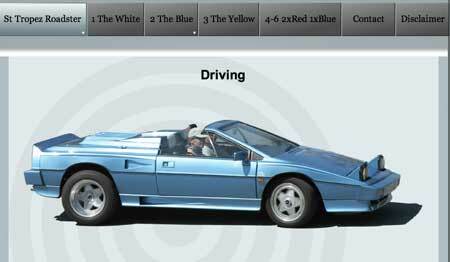 It'll presumably do the same to raindrops when one is travelling at speed, though quite what you're meant to do when the car is stationary one can only speculate, since like Bertone's Athon show car of 1980 there's no provision for a hood. 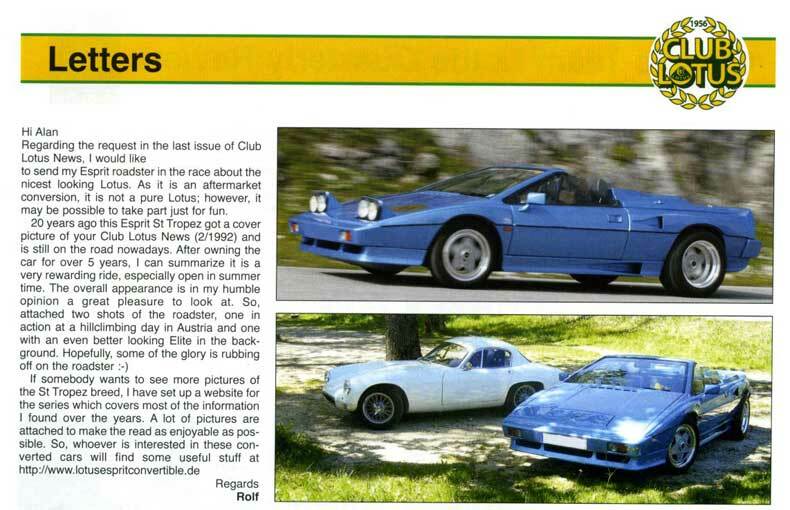 from the website of Swiss Lotus www.lotusteam.ch which they apparantly call Kollinger. 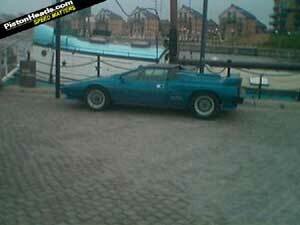 These pictures were taken at the Club Lotus Festival at Donington in 1998 by a German LEW user. 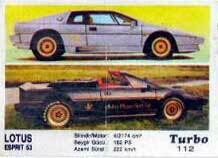 The car is a prototype of the Lotus ESPRIT "St. Tropez" built in small series From this small series - there only exist approx.. 40 cars world-wide. The car, as it looks now (with the away-hinged Cabrio roof, the spoilers, the magnesium rims and the 43,700 km -not miles) is unique. It belongs however into affectionate collecting hands and not into the hands of a young speed freaks. The car has approx. 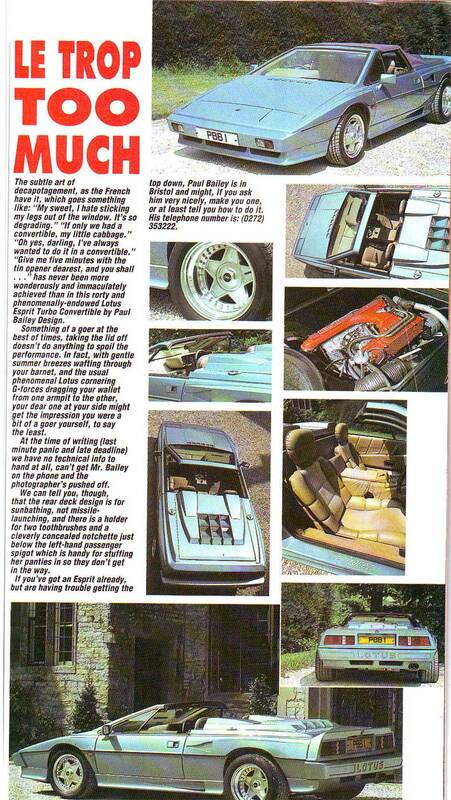 300-Turbo HP, inside leather, sound system, hardtop- away-hinged (not removable) Cabrio roof... The sound is ingenious... Now everything was exchanged, headlight, brake assembly, chassis, electronics, elbow union, radiator, leather equipment, magnesium running rims, Lotus emblems... etc.... 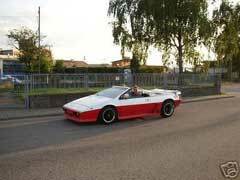 The lacquer finish of the vehicle was not renewed yet, thus you can paint it in any colour you like.. I do not think that this is a prototype of the PBB St. Tropez versions. 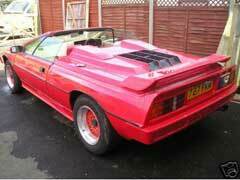 I think it's a "Ritchies Design" because LOTUS / Ritchies is stamped on the registration plate. 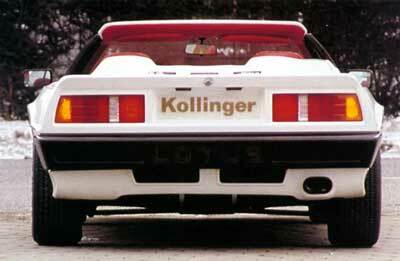 Different roof design, different turbo and earlier origin of this car makes me sure it's not PBB and not Kollinger. 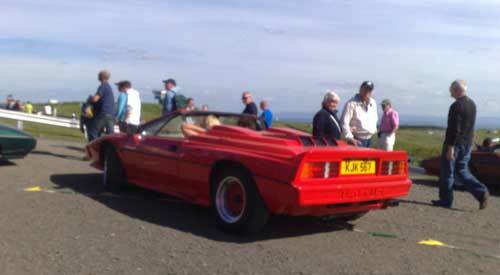 This Esprit Cabriolet was displayed at the Jim Clark Remembrance weekend at Knockhill in 2008. 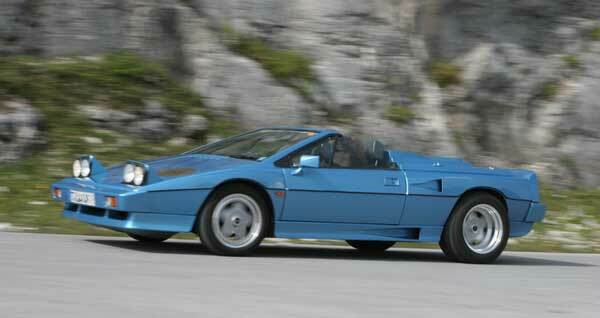 German Site dedicated to the St Tropez convertible Esprit. 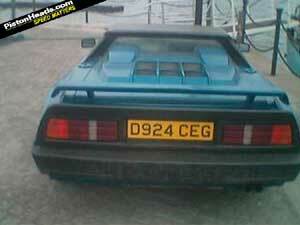 If you have any further information on this Esprit. Feel free to e-mail so I can add it to this page. 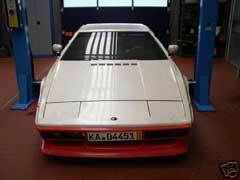 kato@lotusespritworld.com. 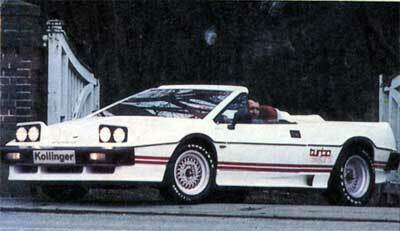 I'm still in need of more information about my Esprit cabrio. 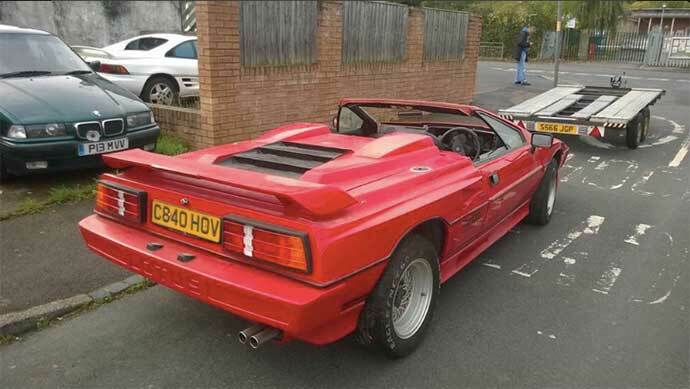 This time I would like to ask LEW to add an actual picture and ask anybody who can provide me with any information about this Esprit. 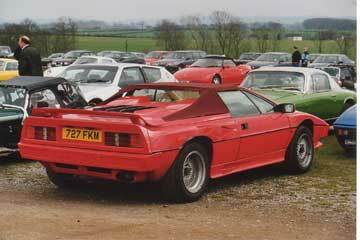 What is proved by documents is that this car was registraded 1986 by Alan Maddock together with the Lotus Dealer Ritchies at Glasgow, 393 Shields Road. Its documented because it was exported at this time. (most probably to USA (remember LHD version). 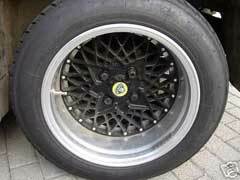 in 2001 it was reimported by Allan Maddock to UK. So is there any one from Ritchies who remember or has pictures or documents?For example from the time before the export? Are there any traces in the USA about this car? 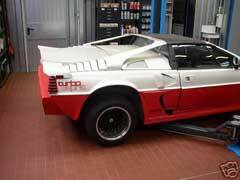 After a long search is now clear that this car has a Lotus Replacement Frame with the number LR003. 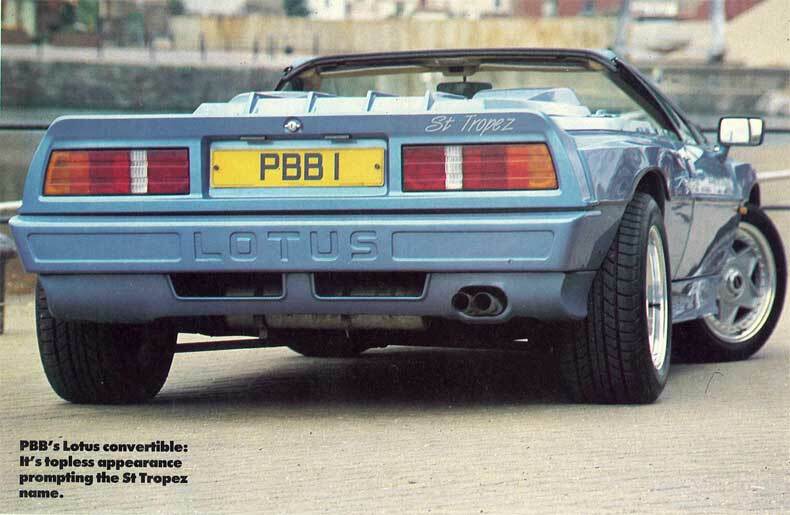 Lotus itself has no entries in their database for this. 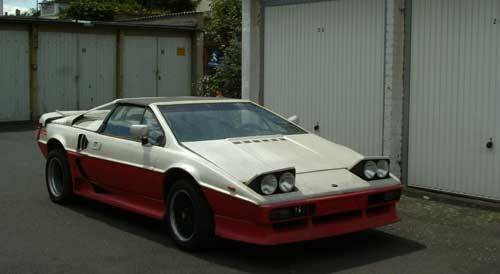 Is there anybody who can assume any date for the third replacement frame for an Esprit leaving the Lotus factory? PS: And is there really nobody with any remembering about a 907 (not 910) motor with the turbo on the right side instead on the left? 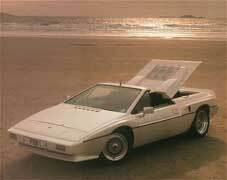 Image from Twitter of Esprit Convertible on the beach that we'd not seen before. Enjoy! 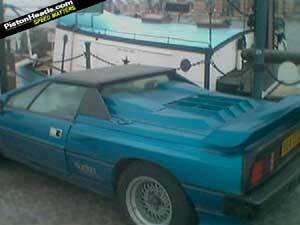 Image from Twitter of Esprit St Tropez possibily either going or coming off that trailer, but who knows. We're just happy to see the picture of this rare beast.